Fans finally get a proper finale to the famed series that delivers on all points. I was a fan of football head, er, I mean Hey Arnold back in the day when it aired on Nickelodeon, as it tended to play out more like a sitcom of sorts rather than a typical cartoon. I’m pretty sure I’ve seen every episode of it, and it was really disappointing the way it ended on a cliffhanger back in 2002. After all these years and the good but box office flop Hey Arnold! 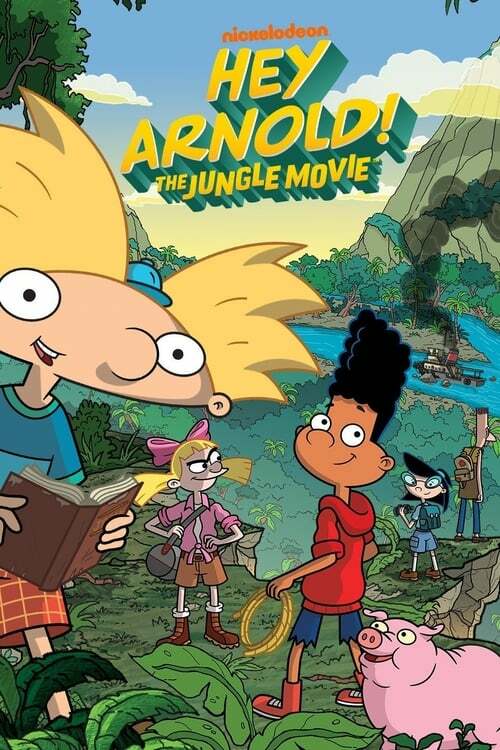 The Movie, we finally get to see what happens next in Hey Arnold! The Jungle Movie that takes everything fans loved about the series and delivers a fun treat for all who watch. Things kick off with our hero Arnold (Mason Vale Cotton) and his best friend Gerald (Benjamin Flores Jr.) trying to make a humanitarian video during their summer school break in order to try and win a contest where the winners go to San Lorenzo, the place where Arnold’s parents were last headed as stated in their journal he found in the series finale. Sadly the video doesn’t win, but Helga (Francesca Marie Smith who voiced her in the series as well) who has secretly loved Arnold since the series began, uses video footage she’s saved over the years of some of the kind deeds Arnold has done and turns it into a video for him to enter the contest again with. Sure enough the video wins and Arnold and friends fly to San Lorenzo, where it isn’t long before trouble gets in the way of him trying to find his parents. This comes in the form of a mercenary named Lasombra (Alfred Molina) who is obsessed with finding the hidden place where his parents were headed, as there’s supposed to be untold treasures there. Of course Arnold and the gang aren’t about to let this happen, and it’s one adventure after another as they try to stop Lasombra and his gang, and hopefully find Arnold’s long lost parents. As with the series and previous movie, I had a great time watching this as I’ve been waiting for what feels like forever and a day to see what Arnold and his friends were going to do after finding that journal. I’m glad the cast and crew did their best to make it feel like the show picked up right where it ended, and make it feel as though the movie never lost a step coming from the series. If I do have a gripe, it’s that I wished this was a Blu-ray release instead of DVD one, as the visuals and audio are good but of course can easily be better in high definition. Also this release lacks any special features, which is a real shame considering they could’ve easily made one regarding series creator Craig Bartlett and Nickelodeon parting ways for awhile after the original movie was released, and how they were able to come back together after all these years and such. Hey Arnold! The Jungle Movie is a great time for fans and those new to the show alike. It picks up where the series left off without a hitch and the cast and character are just as fun and awesome as they were back in the day. While I wish this was released on Blu-ray instead and had some cool extras, this DVD release has enough fun for anyone ready to kick it with Arnold and the gang.